Summer coolant Jal Jeera emerged from the northern parts of the country due to it’s cooling effects on the body. This refresher was created by a group of people on the banks of Ganges where it was prepared with silbatti (stone slabs) grinding all the ingredients finely, after which the powder was mixed with water and preserved in clay pots to keep it cool. Sip, relish and savour this coolant from Luke’s recipe corner and beat the heat out ! Combine all the ingredients (except water) into a processor. Grind until all blend well. Finally add 3-4 cups of water or as required. Serve your jaljeera chilled with some finely chopped raw mango,lime wedges and mint leaves. If you like it sweet, then add organic raw honey or jaggery. 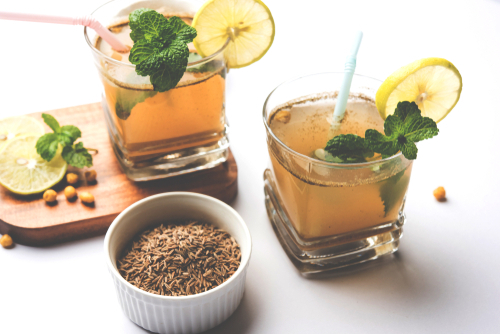 Cumin boosts the digestion process relives intestinal gas, acidity and bloating. The black salt /rock salt /Hing acts as a good digestive. The fresh mint/coriander helps to regulate our body and keep it cool. The grated ginger or ginger powder is a great remedy for nausea and treats abdominal cramps too. As you sip the coolant and take in all the spices it is easily absorbed into the system through osmosis and kills all the microbes .